Ngurore Cattle Market, Yola South LGA, Adamawa State, where our correspondent bought cows and foodstuff for the investigation. In this investigation, IBANGA ISINE uncovered how in a single trip, traders could pay as high as N300, 000 in illicit charges to police, soldiers and criminal gangs on highways, costs that directly go to increasing the prices of food for average Nigerians. AFTER passing six empty checkpoints in Adamawa, the truck conveying dozens of cattle slows down at a checkpoint a Mataba Appawa Gida in Lau, Taraba State, and the driver sprightly looks down and chats with the policemen at the road-side. The dialogue lasts 15 seconds. Turning to the fixer, he said, “Give me one thousand naira,” and the amount was thrust into his hands. Then, the driver hands the note to the armed officers and a barricade is removed for him to continue his journey. The driver, a tall and skinny man, is flagged down at yet another checkpoint, 200 metres away, and he pays N500 after begging the Nigerian Immigrations Service (NIS) officers who are armed with AK-47 assault rifles. At the next checkpoint 50 metres away in this restive state beset by herdsmen clashes, the truck-man doubles his pay-out, this time, to policemen. Less than 10 kilometres into the journey, over N2, 500 had been paid. But this is a 900 kilometre journey from Adamawa in Nigeria’s far north to Akwa Ibom in the south. The charges are illicit, and are hardly receipted. Security operatives manning roadblocks across the country routinely collect bribes from all classes of travellers. But just how high the amounts could go for traders on the north and south routes, and most importantly, how such brazen illegality can practically push the prices of goods up, has never been documented. Working undercover for weeks, our reporter obtained first-hand evidence that proves the shocking scale of corruption and extortion by the nation’s security forces on federal and state roads, and how this has significantly tuned up the cost of food and goods, leaving average Nigerians to pay dearly for them. In the journey undertaken in January, this newspaper found that traders conveying foodstuff and livestock between northern and southern Nigeria spent a minimum of N300, 000 per trip on extortion by security operatives and criminal gangs parading as state and federal agents. When this amount is added to the N550, 000 paid for truck hire, a minimum of N842, 000 is spent to convey foodstuff and livestock between Northern and Southern Nigeria, we found. Traders expectedly transfer this cost on ordinary Nigerians. This has seen cattle that should sell for N140, 000, sold for between N180, 000 to N200, 000 down in southern Nigeria. Also, 20 litres of cooking palm oil that should sell in the north for N7, 000, goes for almost double the amount for the best quality. In interviews, traders shared with this newspaper, their templates for arriving at the final sale price for their goods, depends on the amount they pay security operatives, fake revenue officials and gangs. The implication is that with the attendant hike in cost of goods, an average family that earns N80,000 monthly can buy far less food than they should be able to afford had the illicit charges on the highways been waived. Our correspondent, who joined a truck from Yola, the capital of Adamawa State, to Uyo, the capital of Akwa Ibom State, counted a total of 154 checkpoints. The investigation was carried out a few weeks after the Nigerian Army and the Nigerian Police ordered the dismantling of checkpoints across the country. The order followed an earlier report by this paper, which showed how bribe-taking security operatives pushed petrol and food to Boko Haram and sabotaged the war against terror. A few days after the report was published, the leadership of the Nigerian Army came hard on some of its operatives identified in the story. It also ordered all checkpoints to be dismantled across the country while it invited some of the commanders involved in the crime to Abuja for interrogation. A week after the military ordered its operatives off the country’s highways, the former Inspector General of Police, Ibrahim Idris, issued a similar order to the police. Idris directed that operatives should set up observatory posts and should not be found mounting checkpoints. To carry out the investigation, our correspondent contacted the Adamawa State Chairman of the Amalgamated Foodstuff and Cattle Dealers Association of Nigeria (AFCDAN), Inua Abubakar, and asked for assistance to start a cow-selling business. Our correspondent told Mr. Abubakar of his desire to buy cows, goats and rams from the Ngurore Cattle Market for sale in Nasarawa Cattle Market in Uyo. The cattle dealer, who is also a transporter, therefore, assigned his aides to assist our correspondent in buying the animals and foodstuff needed to start the business. On Wednesday, December 12, 2018, our correspondent, assisted by two of Mr. Abubakar’s aides, bought two cows, a ram, 10 goats and assorted foodstuff at the busy Ngurore Cattle Market in the outskirts of Yola town. The cows cost N130, 000 each while the 10 goats cost N12, 000 each and the ram, N25, 000. As a beginner, he reasoned that it was impossible to pay a whopping N550, 000 to hire a truck to Akwa Ibom. He, therefore, advised our correspondent to wait for South-south-based cattle dealers, who would be coming to the market the next market day (Wednesday). The animals were moved to one of the Fulani herders, who operate a holding farm near the cattle market until there was a truck loading for Akwa Ibom. The farm owner charged N3, 000 for the one week the animals were kept and fed. On Thursday, December 20, 2018, a cattle dealer from the South-South, Ibrahim Dada (not his real name) accepted to load the animals and foodstuff alongside his 32 cows and four goats for the trip to Uyo. Dada, who was introduced by a kind-hearted cattle trader at Ngurore Market, also gladly accepted to serve as a fixer for our correspondent in the course of the investigation. He has just paid N550, 000 and hired a DAF truck that would convey the animals and foodstuff, including Irish potatoes, tomatoes, onions and vegetables, to Akwa Ibom. As the animals and foodstuff were loaded by the truck boys who our correspondent later learnt received N25, 000 each on a single trip with the duty of protecting the animals and ensuring they do not fall on another. Even with their attention, two of the goats bought by our correspondent died when cattle fell on them as the truck hit dangerous potholes during the long journey. Dada opened up on the ordeal of traders on the nation’s highways as a way of introducing his apprentice to the business. While applauding security operatives for doing a “good job” by reducing the cases of armed robberies on the roads, he said traders and drivers, especially those conveying livestock and foodstuff pay outrageous sums in bribes. According to him, every truck conveying livestock and foodstuffs pays a minimum of N500 at every checkpoint. “In fact, they demand N1, 000 at every checkpoint and youth gangs demand more. You dare not try to give them anything less,” he narrated. “If you run away, security operatives will allow you go but no matter the distance you cover, they will pursue you with a motorcycle and force you to make a U-turn and drive back to the very spot you were supposed to pay the money. “Sometimes, they will give the driver the beating of his life and then delay the vehicle for hours before collecting double of what they initially demanded. “But if they don’t want to come after you, they will alert the next checkpoint and you will be forced to go back and pay double of what you were asked to pay,” Dada said. Truck boys on top of the truck trying to control the cows after loading them. The DAF truck took off at 10.45am from the loading bay near Ngurore Cattle Market with 34 cows, 14 goats, a ram and the foodstuff. Before boarding, the fixer had struck a deal to allow his apprentice (our correspondent), to occupy the sleeping bay located directly behind the truck driver. The driver, Isa (not his real name), a petit Fulani man in his early 30s, was friendly and could speak pidgin English. Between Ngorure and the border between Adamawa and Taraba states in Mayo Belwa, the truck passed six checkpoints – four were manned by police and the remaining two by soldiers. Curiously, there were no security operatives in sight when the truck passed the six checkpoints. After Zing, the next checkpoint was located near the Federal Road Safety Corps (FRSC) Unit Command in Lau Local Government Area of Taraba State. The FRSC operatives merely signalled the driver to go on when the vehicle got to their observatory post. The floodgate of checkpoints opened in Lau Local Government Area of Taraba State and continued to Cross River State. The first bribe paid was at a police checkpoint in Maraba Appawa Gida and the police sergeant was not discreet about his intention as he simply greeted the truck driver and added, “Malam where is my N1, 000,” and the driver handed him the money. He thanked the driver and handed him a stick of sugarcane, ordered the barricade removed and waved the vehicle on. During the trip, which is approximately 900 kilometres on one of the most deplorable federal highways in the country, policemen and soldiers shamelessly flouted the directives of their leaders. Our correspondent saw first-hand, how armed gangs, Nigerian Police, Nigerian Army, Nigeria Immigration Service (NIA), Nigeria Security and Civil Defence Corps (NSCDC) and the National Drug Law Enforcement Agency (NDLEA) used checkpoints to fleece traders. Fake federal revenue officials and others purporting to work for Benue, Taraba and Cross River states, also created barricades along the route to charge traders. The only agencies whose operatives did not extort from the truck throughout the journey were the Federal Road Safety Corps (FRSC) and the Nigerian Customs Service (NCS). Benue State recorded the highest number of checkpoints with 84, followed by Taraba with 36 and Cross River with 24, Adamawa with seven and Akwa Ibom with only three. While all the four other states collected revenue for livestock and foodstuff transported through federal highways passing through their domains, Akwa Ibom charged nothing and had no revenue agent or gangsters on the roads. Adamawa State did not have any revenue agent on the highway but sundry revenues were collected at the truck’s point of departure. Out of the 154 checkpoints recorded across the five states the truck traversed, the Nigerian Police had the highest number with 91, followed by criminal gangs with 18, some of which created barricades less than 200 metres from police and military checkpoints. The Nigerian military came third with 17, followed by the NIS with six, while the FRSC had four and the NCS and the NDLEA had three checkpoints, respectively. While the police had the highest number of checkpoints and caused the most delay, the youth gangs, which brandished dangerous weapons, however, extorted the largest amount of money in the course of the trip. The driver and fixer occasionally argued with the policemen and got rebates which enabled the payment of N500 instead of the fixed N1, 000 bribe, but the gangs were mostly not open to negotiations. Apart from the few instances where they escaped into the bush at the sight of revolving lights from approaching police vehicles, the gangs were brutal and unkind in their demands. Just as the security agencies kept vigil to extort mostly truck drivers, the gangs never missed an opportunity to get their own share. There were no gangs’ checkpoints anywhere in Adamawa and Akwa Ibom states. Our correspondent reported a few checkpoints after the vehicle exited the Jalingo city gates, but ran into multiple checkpoints while approaching Wukari. From Wukari, the checkpoints were endless and some were located less than 200 metres apart. This newspaper learnt that the duplication of checkpoints along the highways is a deliberate ploy to extort more money from truck drivers who travel mostly at night. For instance, when a team of policemen consisting of between four to five operatives are assigned to a checkpoint, they break into three different teams and recruit local youth to help them extort from motorists. That explains why it was commonplace to find teams consisting of two policemen and three local youth manning checkpoints about 200 metres apart. Curiously, some of the gangs that operated within the Taraba, Benue and Cross River states created barricades less than 300 metres from checkpoints manned by Nigerian security operatives. Findings by this newspaper showed the gangs work for local politicians, a situation that made the police and the military turn blind eyes their criminal exploits. Even when our correspondent complained to the police and the military about the activities of the gangs, they instead demanded their share of the bribe than take action. At 1.22 am, the truck got to the Federal Ministry of Agriculture Quarantine Service post in Katsina-Ala where the truck stopped and paid N18, 000 and got government’s official receipts. While the movement inspection form carried the correct date, with the authorizing officer’s phone number indicated as 07031198950, the inspection fee receipt with No. 2549 was, however, dated December 18, 2018. At 1.23 am the truck got to the NDLEA checkpoint in Katsina-Ala, whose officials never checked the truck for drugs but insisted the driver pays N1, 000 and vowed to delay the vehicle until the money was paid. At 1.47 am, about one kilometre after the Katsina Ala Roundabout, the truck got to another police checkpoint and they demanded N1, 000. The driver and the fixer begged but they would not budge. After waiting for over five minutes, our correspondent personally got down the vehicle and introduced himself as a lecturer from the AUN Yola on an experimental trip and begged them to acceptN700. “Sorry Oga,” the inspector responded, “Your driver lacks good manner of approach. He was telling us he paid money to soldiers instead of begging us to consider him. “When I asked whether soldiers are supposed to collect money on the road, he turned around and asked whether the police are supposed to collect money. What kind of insult is that?” he asked, fuming. “I am sorry he asked whether the police are mandated to collect money on the road. He doesn’t know how to respect officers. I’m sorry about everything. Kindly let us go, so the animals don’t get fatigued,” our correspondent said to the officer. At 3.41 am, another drama ensued when the truck got to a police checkpoint on the side of the Benue border. When they demanded N1, 000, the driver told them he just paid the same amount to soldiers less than 600 metres away. The officers flew into a fit of rage, querying why the driver bribed soldiers instead of them and the leader of the team ordered the fixer to come down and offer explanations. “Oga come down. Come down now. You said you paid money to soldiers. Are they supposed to stand on the road and collect money?” he asked angrily. “I don’t know. But the truth is that we have been paying money to your people, soldiers, Immigration officials, NDLEA and even touts since we left Yola yesterday,” the fixer replied. “You shouldn’t have paid them. They are not supposed to stand on the road and collect money. That is not their job,” the policeman continued. “Yes, of course, it is the duty of the police to maintain internal security and not that of the military. We can collect money on the road but the military cannot. Abeg bring our money,” he replied. “Don’t disgrace yourself here oga,” the fixer told him, adding that we have been on the road since Thursday morning and have a long way to cover before we arrive Akwa Ibom. When our correspondent spoke more of Ibibio language with him, he directed his men to clear the barricade and waved the driver to go. While approaching Ogoja, the driver, who was engaging in a lively conversation, suddenly became uncomfortably quiet and was hitting more craters and applying the brakes carelessly. At 4.52 am, the driver suddenly pulled over, went down with sachet water and washed his face, sneezed several times, climbed back to his seat and took three long puffs from his snuffbox. It was obvious he was tired, sleepy and struggling to stay awake as he pulled the truck on the road again at 5.07 am so as to move away from the part of the road considered risky and susceptible to robbery attacks. At 5.14am, when the truck got to Ogoja Junction, the driver pulled over and slept for about two hours while the truck boy refuelled from a diesel reservoir. Back on the road, another drama unfolded at Mbok village in the outskirts of Ikom when NIS operatives flagged the truck to stop at 8.21 am and demanded N1, 000 bribe. The driver offered N500 and the operatives got angry and ordered the vehicle to park by the side of the road. The driver cleared the vehicle and for over 30 minutes, they returned to the roadblock to extort other truck drivers. It was at that point our correspondent approached one of the operatives and requested to know the leader of the team. “Go there and talk to our oga (leader),” he responded, pointing to a man in mufti sitting on a white plastic chair. “Good morning Sir,” our correspondent greeted. “Yes, what can I do for you Mr. Man,” he replied angrily. “Your officers have kept us for over 30 minutes and haven’t told us our offence,” the correspondent told him. “I didn’t say so but I want to know why you stopped us because as it stands, there is no illegal immigrant among us,” the undercover reporter replied. “Who are you? May I know who you are to challenge me in my office? What gives you the nerve to tell our officers how to do our job?” the officer, who appeared drunk and pale, barked. After he saw the American University of Nigeria’s identity card held by our correspondent, the immigration officer said the reporter was under arrest because a staff of AUN was previously arrested with the Nigerian and Cameroonian passports and he was allowed to go on self-recognizance but would not return to settle them. “You are under arrest and will not be allowed to go until you produce the AUN staff that ran away. You think you can teach me how to do my job. I will show you something today,” the angry officer said. The truck was parked for over 30 minutes until our correspondent threatened to call the NIS headquarters that some junior officers came over and whispered to the team leader to free the journalist and the truck and he obliged. After the arrest, the trip became smoother and less bribes were paid until the truck got to Uyo at about 8 pm on Friday, December 21, about 35 hours after the journey began. The National President of the Amalgamated Union of Foodstuff and Cattle Dealers Association of Nigeria (AUFCDAN), Maina Abdul, corroborated our findings, saying his group has been fighting the menace with little or no success. He told our correspondent that AUFCDAN has engaged with the Presidency, the military and police high command and the state governors in a bid to halt the trend. Abdul insisted that the divisional police officers (DPOs), military commanders, council chairmen, governors, the military and police high commands and President Muhammadu Buhari were aware of the matter. “We have met and discussed with all of them but the extortion is still continuing. Governors will tell you they are not aware of youth extorting money from the highways but that is not true. He argued that when traders spent so much on the road while conveying livestock and foodstuff to where they are needed, the cost is passed onto the consumers. Also speaking, the Adamawa State chapter Chairman of AUFCDAN, Mr Abubakar, said many dealers have gone out of business, adding that only butchers were now doing the business. He said the problem of extortion and multiple taxes started in 2015, adding he has personally fought the menace right from the beginning. “As soon as I was appointed the chairman of the association, I went to the then Assistant Inspector General of Police (AIG), Zone 3, Lawan Tanko. “I sat with him and discussed the implication of extortion because the police and other security operatives do it openly. Everybody sees it. “He told me he has heard and knows about the practice and was fighting it but added that nobody has ever complained to him directly about the unwholesome practice until I approached him. I had also met the Commander of the 23 Armoured Brigade in Yola and told him about the extortion,” Abubakar said. Inua said security agents started extorting from traders when it was rumoured that some livestock and foodstuff dealers were fronting for Boko Haram. To address the problem, he said AUFCDAN created a clearance receipt to enable its members move foodstuff and livestock within the country. Even with the receipt which was approved by both the military and police high commands, the extortion continued. As IGP, he said Solomon Arase had donated a van and assigned an assistant commissioner of police to work with the union, adding that after he retired, the situation has worsened. This newspaper found out that every kobo spent in multiple taxes and extortion is ultimately borne by Nigerian consumers. For instance, when the fixer added N550, 000 cost for truck hire to the N292, 100 paid in bribes, the total expenses on the road got to N842, 100. With the N842, 100 spent on the road, each cow in the truck landed in Uyo with an additional cost of 20, 000 while N1, 000 was charged for each of the goats and the ram. Therefore, when N20, 000 transport cost and another N20, 000 being profit are added to the N130, 000 used in buying one cow, the final cost of the cow in Uyo becomes N170, 000. The same applies to goats, rams, foodstuff and other goods which are transported from northern to southern Nigeria and vice versa. Inua, who is also a transporter, said the high cost of truck hire is attributable to the bad road and delays at checkpoints which increase the travel time by over 11 hours. The truck driver, Isa, said the cost of the truck hire could have been between N250, 000 – N300, 000 if the roads were good and the travel time not unnecessarily extended due to the close to 150 checkpoints along the way. “Normally Oga, we would charge between N250, 000 to N300, 000 on the route but we cannot because of the bad roads that destroy our trucks and the time we spent at checkpoints. “We spent more than four days to get to Akwa Ibom and return to Yola and we normally don’t have any load on the return trip. We also spent a lot to service the vehicle each time we return from a trip and that is why we charge N550, 000,” he said. Speaking on the multiple checkpoints and extortion by youth gangs in Cross River State, the Chief Press Secretary to the Governor, Christian Ita, said the government does not collect revenue on federal highways anywhere in the state. Reminded that all the receipts from the gangs carry imprints of the state government, he said the documents were faked. “I can tell you that the Cross River State Government does not collect revenues on federal roads. So any person collecting revenue on federal roads and issuing receipts is fake and should be arrested,” Ita said. He, however, noted that the state government collects levies from heavy-duty trucks plying its roads as part of measures to ensure such roads are properly maintained. When the Chief Press Secretary to the Benue State Governor, Terver Akase, was told the state had 82 checkpoints and extorted so much from traders, he said he could not speak on the issue until he was fully briefed by the relevant officials of the government. Akase never got back to our correspondent at the time of publishing the report. On his part, the Special Adviser to the Taraba State Governor, Bala Dan Abu, admitted the government was aware of the extortion on federal highways in the state. Abu, however, said the state government does not collect revenue from federal roads and has not appointed agents or persons to do so, adding the problem has persisted because of the failure of security agencies. “The government is not unaware of the extortions that are going on but the security agencies like the police and the military who own and man checkpoints should do something about it,” he said. “You know that the legal and illegal checkpoints are not far from each other and they are aware of what is happening. So why are they allowing the gangs to operate freely on the roads? “The roads are very insecure, not only in Taraba, Benue and Cross River. It is everywhere. The roads are not safe. It is the duty of the security agencies to tackle these issues. “State governments don’t own security forces and they don’t control the police or the army or what happens on federal highways. The whole thing boils down to the failure of the federal government to do what is necessary to secure the roads. Weeks after this newspaper completed this investigation; it was difficult to get the spokespersons of the Nigerian Police, the Nigerian Army and the Nigerian Immigrations Service, to speak on it. However, after several attempts, our correspondent secured an interview appointment with the Acting Director of Army Public Relations, Sagir Musa. “As you might be aware, there have been sincere efforts on the part of the leadership of the Nigerian Army to ensure that the ugly trend of extortion and the violation of human rights by personnel are drastically curtailed if not completely stopped,” he began. “We’ve had engagements with traders and transporters including those buying cows and foodstuff cross the nation. Like you rightly observed during your undercover investigation across five states of Adamawa, Taraba, Benue, Cross River and Akwa Ibom, you saw only seventeen checkpoints. “Again, like you observed, some checkpoints just waved to show appreciation without asking you for anything. But wherever extortionist tendencies were observed, I can tell you it is not allowed by the military. “We have made it consistently clear the army does not encourage or condone unprofessional conducts as reflected in the extortionist tendencies you witnessed. “It is illegal and wherever we are able to get reports, and especially when they are confirmed, the leadership applies sanctions maximally. The essence is to ensure the ugly trend is completely wiped out of the Nigerian Army. He, however, noted that despite the COAS’ directive for checkpoints to be dismantled, the need to maintain military presence in trouble-prone areas has made it necessary to allow checkpoints in some areas of the country. The spokesperson of the NIS, Sunday James, rebuffed every attempts to get him to speak on the findings of this report. During the three weeks of constant attempts, James would not pick calls or respond to several text messages from this newspaper. However, on Wednesday, one of our correspondents visited the NIS headquarters in Abuja and sought an audience with him. After filling the visitor’s slip and it was passed onto James, the reporter waited for over two hours without being attended to. While waiting, our correspondent called James’ number twice and also sent a short message indicating his presence at the facility. Unable to wait any longer, the reporter made to take his leave but one of the officers on duty approached and urged him to wait a little longer while he made efforts to get the PRO to attend to him. For close to an hour, nothing happened until the reporter took some shots of the NIS headquarters’ reception desk to trigger an alarm by the NIS security camera operators. Immediately, the operatives swopped on the reporter, forcefully seized his phone, break into the picture gallery and deleted the pictures before asking him to leave. On his part, the Force Public Relations Officer, Frank Mba, said the Nigeria Police is committed to stopping extortion on the highway and called for collaboration with the media. According to him, while it is good to report, he argued it would be better for the media and the police to work together to find a solution not only for the problem of extortion but other security challenges in the country. “If the purpose is to just to report, then we will not achieve the desired change we are looking for. I think the media should do more and collaborate with us to find solutions to some of the problems instead of merely reporting to shame,” he argued. 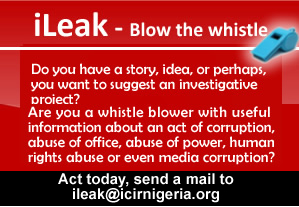 This investigative report is supported by Ford Foundation and the International Centre for Investigative Reporting (ICIR).